The low California overwintering monarch population increases the urgency of our need for more data during the breeding and overwintering seasons in the Southwest. There are several calls for data in the Southwest for Citizen Scientists depending on the amount of time you have available. Monitor a milkweed patch in your own backyard or a nearby park, church, work or natural area. 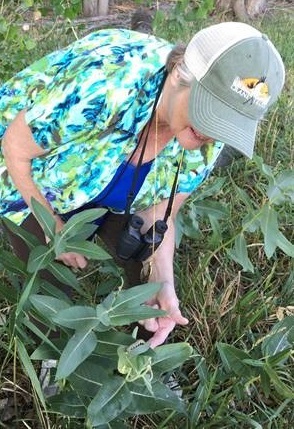 We are looking for locations across the Southwest for Citizen Scientists to monitor weekly for monarch adults and their immatures and habitat conditions. Please let us know if you are interested in participating – your data will be part of a published study in the future. We will provide needed information so you will be successful and help you with any questions along the way. Email us at info@swmonarchs.org if you are interested. Here is a link to the Excel form and also a copy to take in the field – use hash marks to help you count. To help you monitor larvae, A Field Guide for Monarch Caterpillars by Karen Oberhauser and Kristen Kuda has easy to read information and photos to help you in the field. Webdesign Copyright © 2010-2018 Southwest Monarch Study Inc.